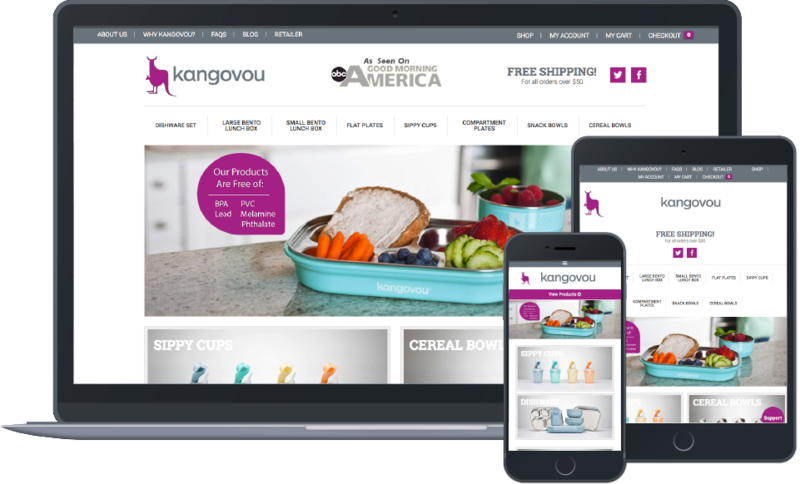 Kangovou is a dish ware company in North Carolina that specializes in making BPA, lead, PVC and melamine phthalate free products. Their mission is to provide you and your family with a superior, healthy option for storing and transporting your food. All of their products are made with high-quality stainless steel, and contaminant free plastic. The main goal of Kangovou's digital marketing campaign was to increase the amount of purchases of their products. Kangovou primarily wanted to increase online visibility awareness of their flagship product, bento lunch boxes. In addition, they were looking for relevant content that would help them rank nationally for the dishware products they sell. Kangovou wanted to increase their social media following as well to reach out to several different demographics. Since the project start, we have written and published several pieces of content for Kangovou. We have built custom product pages to best feature their dishware as well as integrated WooCommerce into their website to allow users to easily purchase their products, even in bulk. We have conducted outreach campaigns to help Kangovou develop strategic media partners. As a result, Kangovou has received a mass following on Facebook and Twitter, allowing them to receive even more purchases on bento lunch boxes and other BPA-free products. They were even featured on ABC's "Good Morning America" where they were able to showcase their top-tier products.